Human quantum computers; autonomous aerial vehicle lab; invisible displays. While much has been made of quantum computing processes using ultracold atoms and ions, superconducting junctions and defects in diamonds, researchers are questioning if this could be performed in human brains. In fact, UC Santa Barbara theoretical physicist Matthew Fisher has been asking this question for years. And now as scientific director of the new Quantum Brain Project (QuBrain), he is seeking to put this inquiry through rigorous experimental tests. For example, some functions the brain performs continue to elude neuroscience such as the substrate that “holds” very long-term memories and how it operates. Interestingly, it is now believed that quantum mechanics, which deals with the behavior of nature at atomic and subatomic levels, may be able to unlock some clues. That in turn could have major implications on many levels, from quantum computing and materials sciences to biology, mental health and even what it is to be human. While the idea of quantum computing in the human brain is not a new one, Fisher has identified a precise set of biological components and key mechanisms that could provide the basis for quantum processing in the brain. With $1.2 million in grant funding over three years from the Heising-Simons Foundation, Fisher will launch the QuBrain collaboration at UCSB. 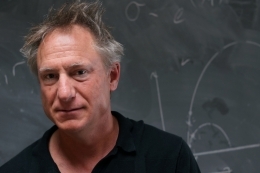 The collaboration will be comprised of an international team of leading scientists spanning quantum physics, molecular biology, biochemistry, colloid science and behavioral neuroscience, and seeks explicit experimental evidence to answer whether humans might in fact be quantum computers. The hallmarks of quantum computers lie in the behaviors of the infinitesimal systems of atoms and ions, which can manifest “qubits” (e.g. “spins”) that exhibit quantum entanglement. Multiple qubits can form networks that encode, store and transmit information, analogous to the digital bits in a conventional computer. In the quantum computers QuBrain will try to build, these effects are generated and maintained in highly controlled and isolated environments and at low temperatures. And given that the warm, wet brain is not considered a conducive environment to exhibit quantum effects as they should be easily “washed out” by the thermal motion of atoms and molecules, Fisher asserts that nuclear spins (at the core of the atom, rather than the surrounding electrons) provide an exception to the rule. “Extremely well-isolated nuclear spins can store — and perhaps process — quantum information on human time scales of hours or longer.” He posits that phosphorus atoms — one of the most abundant elements in the body — have the requisite nuclear spin that could serve as a biochemical qubit. One of the experimental thrusts of the collaboration will be to monitor the quantum properties of phosphorus atoms, particularly entanglement between two phosphorus nuclear spins when bonded together in a molecule undergoing biochemical processes. The research conducted by QuBrain is expected to have the potential for breakthroughs in the fields of biomaterials, biochemical catalysis, quantum entanglement in solution chemistry and mood disorders in humans, regardless of whether or not quantum processes indeed take place in the brain. 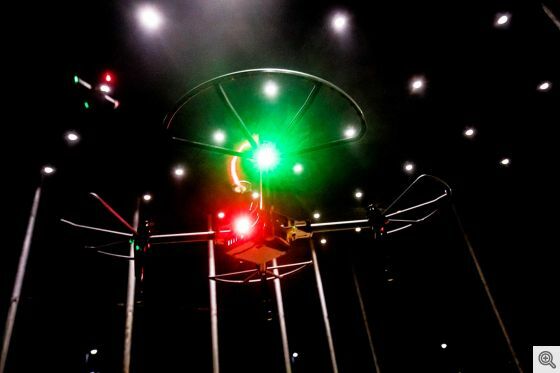 To allow researchers and students to safely push algorithms and equipment to their limits, the University of Michigan College of Engineering has opened an outdoor fly lab for testing autonomous aerial vehicles. 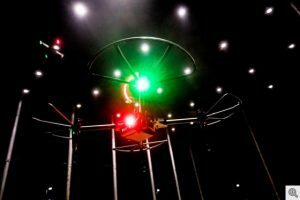 Drones are flown the first flight of M-Air, an advanced robotics testing facility for air, sea, and land, on North Campus of the University of Michigan in Ann Arbor, MI on February 20, 2018. The facility is a netted, 9,600 gross square ft., four-story complex situated next to the site where the Ford Motor Company Robotics Building will open in late 2019. Researchers point out that autonomous aerial vehicles have a host of applications beyond delivering packages. Large ones can be used for commercial transport and national security. Smaller drones could scout disaster sites, inspect infrastructure like bridges and wind turbines, and perform other jobs that are dangerous for humans. They could also gather environmental and atmospheric data. Drones can be expected to work closer to the ground as well for outdoor physical tasks as a complement to surveillance, science data collection and delivery missions. Think unmanned aerial vehicles to clean gutters, inspect roofs for damage and clean windows. In fact, there is already work in the early stages of developing roofing robots that can ferry shingles, and eventually position and install them with a pneumatic nailer. On a bigger scale, M-Air will help researchers test algorithms for control of larger autonomous aerial vehicles with scale models in free-flight. M-Air is a netted, four-story complex situated next to the site where the Ford Motor Company Robotics Building will open in late 2019. With 9,600 gross square feet, it has an 80-by-120 footprint and stands 50 feet high. A pavilion for up to 25 people can host users. Flights at M-Air are considered indoors. They don’t need to go through U-M’s typical outdoor drone flight approval process, which is due to safety concerns about interference with hospital helicopters and other aircraft. Opening the door to invisible displays that would be bright when turned on but see-through when turned off, UC Berkeley engineers have built a bright-light emitting device that is millimeters wide and fully transparent when turned off. The light emitting material in this device is a three-atom-thick monolayer semiconductor. Der-Hsien Lien, a postdoctoral fellow at UC Berkeley said, “The materials are so thin and flexible that the device can be made transparent and can conform to curved surfaces.” Lien is a co-first author along with Matin Amani and Sujay Desai, both doctoral students in the Department of Electrical Engineering and Computer Sciences at Berkeley on a study recently published. The device was developed in the laboratory of Ali Javey, professor of Electrical Engineering and Computer Sciences at Berkeley. In 2015, Javey’s lab published research in the journal Science showing that monolayer semiconductors are capable of emitting bright light, but stopped short of building a light-emitting device. The concept may be applicable to other devices and other kinds of materials, the team said, noting that the device could one day have applications in a number of fields where having invisible displays are warranted such as an atomically thin display that’s imprinted on a wall or even on human skin.